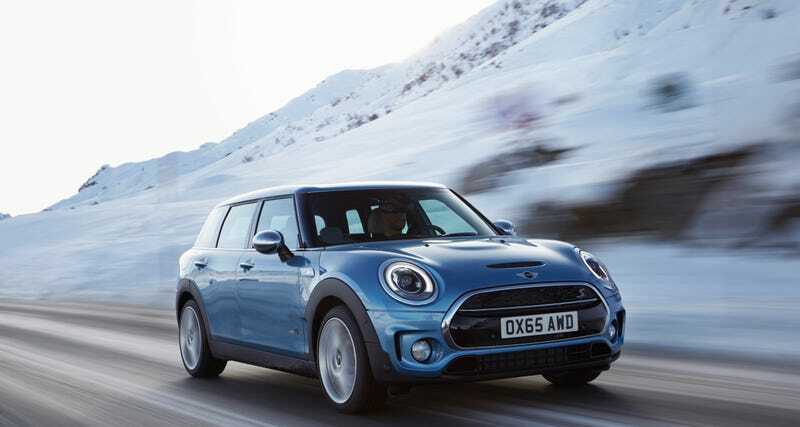 The 2016 Mini Clubman stole our hearts last year, and this plucky little compact luxury wagon, ruthlessly engineered to feel fun without compromising its luxury and efficiency, will get even better when the Clubman All4 AWD variant goes on sale this April. I have to admit that I’m giddy at the prospect of a six-speed turbo-four semi-luxurious and (arguably) attractively styled wagon with barn doors, all-wheel-drive, and a manual transmission on sale for around $30,000 in, get this, America! This quirky little unicorn that is the Mini Clubman ALL4 will be hitting the American market in April of this year, offering AWD capability in a comfortable and practical wagon format, with the same options as the FWD Clubman of either a 3-cylinder or 4-cylinder turbocharged engine offering 134 hp or 189 hp respectively, driven through either an 8-speed automatic or 6-speed manual transmission. Mini claims the 2.0 liter 4-cylinder Clubman S model will hit 0-60 mph in 6.6 seconds with the automatic, or 6.7 seconds with the manual. Mileage figures and an exact price haven’t been released just yet, but expect this AWD clubman to come in a few thousand dollars above the current Clubman’s $24,000 to $27,000 asking price.